Q: Are any vaccines compulsory in the UK Immunisation schedule? No, at present there is a choice. However in recent years there has been increasing pressure on parents who question or decline vaccinations for their babies and children. Some parents are met with disapproval from their GPs and health visitors and treated in a hostile manner for refusing the vaccines. Inform you health professionals that you are investigating the subject and have not reached a decision, and ask them to kindly provide you with more detailed literature to assist you with your research. Whilst we do have a choice here in the UK some countries, e.g. Italy have recently (July 2017) brought in strict mandatory vaccine laws despite public outcry and new laws are due to be introduced in 2018 in France. There are also penalties and increasing restrictions in US, Australia, Germany and other european countries. It is very disturbing that parents who are actually making the effort to do independent and thorough research on vaccination, to reach an educated decision are being labelled as ‘displaying negligent behaviours’. Q: Can the vaccines be administered at a later age? Allow yourself as much time as YOU need to decide what you feel is the best health option for your family whether it be a delayed vaccine schedule or none at all. Vaccines can be given at a much later age if that is where the research leads you. Q: Are GPs paid to administer vaccines? The Government implemented a target scheme some years ago (around 1990) whereby GPs had to achieve a 90% up-take to qualify for a financial bonus. A 70% up-take resulted in a reduced bonus, and below that they received nothing. This scheme did nothing to support parental choice and led to GPs discriminating against parents who declined vaccination for their children. On rare occasions GPs struck these families off their register, so as to avoid losing their bonuses. In recent years fees attached to vaccines have been implemented. On 16 October 2017 I emailed the nhsemployers.org with the following email. I am still waiting for a response and will update when I receive a response. I am writing on behalf of The Informed Parent to enquire about the monetary fees that GPs/surgeries receive for vaccinating their registered patients. In the past there used to be a Target Scheme (1990?) in place and GPs had to get a certain percentage of the babies/children registered at their surgery vaccinated to qualify for the financial bonuses on offer. In more recent times I understand that there are now payments attached to individual doses? £9.80 per dose – Does this payment go to an individual health professional or the GP surgery? Also when was this present payment scheme introduced replacing the target scheme (based on uptake) previously used? Is there any kind of uptake target scheme in place at this present time in addition to the £9.80 per dose? I am often asked about what monetary fees are received by doctors as regards to vaccination programme and therefore I would like to have the up-to-date details on this issue in order to pass on the correct information. Q: Are there any reliable figures to compare complications of a disease with complications from a vaccine? No. Most vaccine reactions go unreported and are usually dismissed as a coincidence. All reactions, whether proven or only suspected, should be reported by your GP using the Yellow Card system. Unfortunately due to the fact that this system is voluntary and that most GPs are reluctant to admit to possible reactions there is gross underreporting. Q: Is it possible for a parent to report a suspected vaccine reaction? Q: What kind of conditions may be as a result of a vaccine side-effect? Allergies, eczema, autoimmune disease eg Guillain-Barré syndrome, juvenile diabetes, arthritic conditions, SIDS, shaken baby syndrome, learning difficulties, attention deficit disorder, autistic spectrum disorder….to name just a few conditions that have been reported/published as very likely to have been caused by one or more vaccines given prior to the onset of the problem. Officialdom quickly dismisses these reports as ‘timely coincidences’ or ‘genetic’ or statements such as: ‘The evidence is inadequate to accept or reject a causal relation between (the vaccine) and (a disease condition)’ are made. Proving a vaccine damage case can be an extremely lengthy process and may take many years to have the damage acknowledged, and compensated appropriately. Q: Vaccine damage is rare - isn't it? Vaccines can and do cause a wide range of debilitating conditions – and to different degrees. 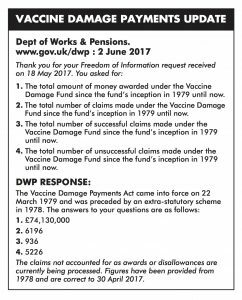 Vaccine damage is much more common than is officially recognised and only around 15% of the claims made under the Vaccine Damage Fund since 1979 have been successful. Some claims take many years to be accepted which can be an enormous hardship for the victim and their family. Most cases fail to have the damage acknowledged. In the more serious cases the parents often become the full-time carers – vaccine damage affects more than just the vaccine damaged individual! Many more vaccine damage cases are coming to light due to the dedication of the Vaxxed team. Polly Tommey, whose son Billy was seriously damaged by the MMR as a baby, has been devoting much of her time since 2016 travelling across the US, UK, Ireland, Australia and New Zealand interviewing numerous parents and families of vaccine damaged victims. A vast collection of video interviews can be viewed on the Vaxxed TV Channel. These cases may have been dismissed by officialdom as anecdotal, but these cases are an example of the true reality of vaccine damage! Q: If my baby has already had the first dose of the baby vaccines, must they complete the course? No, at present you can opt out at any stage of the schedule if you wish. Q: In the reported cases of infectious disease, what percentage are in the vaccinated? Unfortunately the immunisation status is not indicated on the Public Health England website in the data regarding notification of cases. Also when outbreaks are reported in mainstream media the accuracy is open to question. A general rule is to look at what information is omitted e.g. if most cases were in the vaccinated it is likely that there will be NO indication of their immunisation status in the report. Be observant of the wording in media and medical articles – it is often what is not said that is more revealing. Q: Haven't vaccinations had a major impact on the decline of infectious diseases? It is very well-documented that steep falls in these diseases, e.g. diphtheria, measles and whooping cough, occurred BEFORE the introduction of vaccination. Indeed, death rates had fallen by as much as 95% in the pre-vaccine era. This was mainly due to better and less-crowded living conditions, improved nutrition and clean water. In the graphs plotting figures for both cases and deaths – the declines usually run in parallel with each other. The death-rate from whooping cough in England and Wales (Fig.8.12) has declined since the seventh decade of the nineteenth century. The effectiveness of treatment is still in doubt, and the more important issue is the contribution of immunization. Q: Is a vaccination the same as having a small dose of a disease? No. Most vaccines are injected directly into the body by-passing the normal route of a pathogen (bacteria, virus etc). This results in certain aspects of our natural immune response being over or under stimulated leading to a skewed system. Which has the potential to result in developing conditions, such as allergies, asthma, and auto-immune diseases. Q: Is it scientifically proven that if a vaccinated individual contracts a disease then they will only suffer a mild attack? No. Since there is no way of proving the above question – it is just a hearsay. It is impossible to prove as diseases, like measles and whooping cough, have become much milder over the last century so generally most cases will be mild regardless of their vaccination status. Also in some situations a seemingly mild dose of disease in a vaccinated child may be a suppressed version, resulting in the body being unable to fully express the disease. Over the years I have received many reports from adults who received a flu jab and then despite being vaccinated went on to developing a long-lasting and severe case of flu leading to bronchitis! Some researchers may consider that it was more likely to be because of and not despite being vaccinated. Q: Vaccines produce specific antibodies against a particular disease, therefore creating immunity, don’t they? ‘1. You ask about the relationship between seroconversion (in this instance, it is more useful to talk of “sero-response” ie the level of antibody resulting from a vaccination) and protection. It is not possible to make an absolute generalization about what level of antibody is protective in a given individual. However there are some studies which give us very clear ideas. Your question seems to imply that therefore the reverse is true – that whatever seroconversion level is measured, there will be no protection. This is untrue. While the precise level of antibodies needed for protection is not known for each individual, we are sure that protection results when all but very low levels of antibodies exist. Indeed, even with almost unmeasurable levels, there can be what is called an “amnestic response”. That is to say, an individual who has been immunized and found (by laboratory tests) to have negative or very low levels of antibody will, when given the vaccine again or challenged with the actual infection, mount a huge and protective antibody response. In other words, there is NO full understanding in the role antibodies play. When a vaccine is said ‘to take’ on 90% of recipients, that means that those 90% will produce a certain level of antibodies. This should not be equated with immunity, and also antibody level may fluctuate too. Additionally we must bear in mind that many individuals may never contract, eg measles, anyway – it is not automatic that everyone will develop measles – regardless of their level of antibody and regardless of whether they were vaccinated or not. Q: What about herd immunity? We are told that we need to achieve a certain level of vaccination in order to create ‘herd immunity’ in the population. Often vaccination levels, such as 95% are indicated as a necessity to eradicate disease. The theory, based on the assumption that vaccines give immunity, is that when a certain number of individuals are ‘immune’ that this interrupts transmission of the disease, reduces the number of cases and leads to the eradication of the disease. However at any given time, even if 95% uptake was achieved this would only account for the babies and young children receiving the vaccines at that moment. What about the rest of the population? All the adults who may well have never even received these vaccines? Those in whom the debatable vaccine-induced immunity has waned? Those that the vaccine did not take on – termed ‘vaccine failures’? There are many grey areas in this theory and yet it is presented by the authorities as scientific fact. Q: Does an unvaccinated individual pose a risk to the health of someone who has a very compromised immune system? You may have been told that it is your duty to have your children and yourself vaccinated in order to protect those who are unable to be vaccinated themselves due to having very compromised immune systems or those undergoing immunosuppressive treatments etc? Firstly this highlights how toxic and immune-compromising vaccines are. Vaccines are not tolerated in these individuals. Then why should healthy children receive vaccines and risk becoming compromised or even worse, resulting in death, for the assumed protection it may offer someone else’s child? Secondly, why is the following statement made on some Patient Guidelines: Cancer patients should avoid contact with recently vaccinated individuals. This is because there are concerns regarding vaccine shedding, especially with live vaccines. For example, the oral polio vaccine was replaced by the injectable version due to the live vaccine causing many cases of polio. You would be entitled to ask who then poses the greater threat ? We should also be asking why there is such an increase, worldwide, of children developing auto-immune disease and cancers (in the UK cancer is now the leading cause of death in 1-14 year olds) at such young ages and whether the routine baby vaccines are playing a role in many of these cases? Q: What ingredients are in vaccines? Ingredients, such as formaldehyde, known neurotoxins – mercury products and aluminium hydroxide – have been used for numerous years in many of the vaccines. Due to grassroots pressure the mercury product thiomersal has been removed from many of the vaccines. However it is sometimes used in the early stages of vaccine production with the potential to result in ‘trace amounts’ in the final vaccine. Mammalian products are used too, which opens the door to the possibility of viruses from other species crossing into the human system and creating new diseases in humans. This is not a theoretical risk and over the years there have been particular scares regarding contaminated vaccines e.g. polio vaccine and SV40 (monkey virus). Concerns are growing regarding the cumulative and synergistic effects of the ingredients used in vaccines, particularly with the ever-increasing vaccine schedule for both infants and adults. Also concerns about the vaccine ingredients crossing the blood brain barrier and the possible outcomes. Please note: There are significant differences between ingesting and injecting into the body. For vaccine product detail you can visit the electronic Medicines Compendium (eMC) to search for the PIL (patients information leaflet) of a vaccine using its brand name. Q: Are vaccines available in single doses, and would this be a safer option? Vaccines are made separately initially, and where medically indicated would be available. However single vaccines are not generally available and so if you are considering this option you will have to find a private doctor who offers this service. As regards to safety, ALL vaccines have the potential to cause harm. From a ‘common sense’ point of view you might assume that single vaccines will place less of a burden on the immune system than multiple ones, however ALL vaccines initiate an unnatural immune response whether single or multiple – so this is a particularly grey area. Also by separating the vaccines this will result in an increase in the number of injections, resulting in an increase in the number of unnatural immune responses mounted by the body. Another aspect where there is a lack of any thorough and long-term study. By asking this question one is assuming that vaccines offer some protection. Some critics believe that vaccines do not protect at any stage, whilst others feel that infections may be suppressed by the jabs, leading to more chronic illness later in life. Certainly many vaccinated individuals go on to develop the diseases they were supposed to be protected against but it is not often publicised. There are also those who believe that the vaccines may possibly give some kind of short-lived protection but that this ‘immunity’ wanes and leads to teenagers and young adults developing childhood diseases at an inappropriate age. There are homeopathic ‘alternatives’, however many homeopaths prefer to treat constitutionally. The idea of giving ‘protective’ remedies conflicts with their philosophy of treating symptoms – like with like. The most obvious alternative is quite simply HEALTH. Creating and maintaining a reasonably sound, stable and healthy lifestyle is the best way to avoid illness and complications. Diseases do not strike randomly there would have to be underlying factors and weaknesses. Q: Are there any homeopathic remedies that can be administered before and after receiving a vaccination? If you decide to vaccinate there are homeopathic antidotes to the various vaccines that can be given before, after, or at both stages. Additionally some supplements may be recommended by a naturopathic practitioner that may help the baby, child or adult tolerate potential harmful vaccine effects. These options should be discussed with qualified and experienced practitioners. Q: Vaccine safety science - how thorough has this been investigated? The National Vaccine information Centre (NVIC) based in the US highlight a number of key points listed in a summary of a 2013 Institute of Medicine report on The Childhood Immunisation Schedule and Safety. • “Research examining the association between the cumulative number of vaccines received and the timing of vaccination and asthma, atopy and allergy has been limited; but the findings from the research that has been conducted are reassuring.” (5-7) – 14 studies were identified and reviewed by the IOM committee. Q: Are there any recommended websites for further study? Please go to INFO on this website for a list of useful links and the READING & RESOURCES for lists of publications on the subject that highlight a vast body of information that is not widely circulated to the public. If you are particularly interested in historical data visit the ARCHIVE LIBRARY with free downloads available.